This is a lavish pictorial record produced in collaboration with the Royal Geographical Society (with IBG). It features 200 unique photographs taken by Isabella Bird that transport the reader to the China of the late 19th century. It includes supporting text by travel photography expert Debbie Ireland. 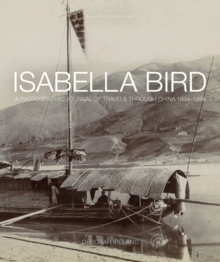 Ammonite Press is proud to collaborate with the Royal Geographical Society (with IBG) in celebrating the achievements of Isabella Bird in this lavish pictorial record of her last great journey through China, in the closing years of the 19th century, with supporting text by travel photography expert Debbie Ireland. Bird was in her mid-sixties when she undertook her travels, to a land that was largely unknown and largely misunderstood in the West, where a woman travelling alone was greeted with incredulity and, occasionally, hostility. The highlight of her visit was journeying by boat and sedan chair to make a major tour of the valley of the Yangtze River and much beyond, right up to the border with Tibet.